Yesterday’s Earth Day installment of Ellen featured a very eco-friendly set of gifts for lucky viewers and audience members. Everything from bikes to blow dryers. But there was one particular product that completely stood out from the rest and everyone should own one (of course, though I say this, I do not yet own one myself). But, the concept is fantastic at least! The giveaways started and truthfully I barely remember the first ‘smaller’ items that were dealt out. The first one that really caught attention was a new combo from Rusk. 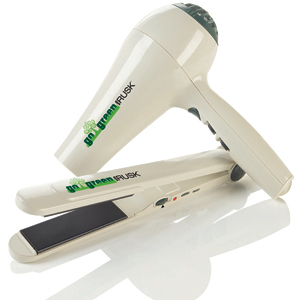 The hair care mega line has gone eco-conscious with a new Go Green line that has launched with a hair dryer and straightener. What’s so special about a hair dryer? This one uses up 26% less energy but still has the same fast airflow and intense heat people know, trust and expect from Rusk. Plus, it’s made entirely out of recycled materials and the printing is even done in a soy-based ink. Same goes for the straightener, minus the hot air blowing of course. But for the straightener, it heats up in seconds (reducing usage time) and has a 10 minute hibernation feature if you’re the type to neglect turned on plugged in things (though this would be a scary practice and isn’t recommended). The heating plates themselves also have a petroleum free coating on them so they’ll last nice and long without being harmful during the production process. The real star of the give away though was a product called Activeion. Like Red Bull, this is a single UPC brand, but like Red Bull, this product has serious potential. Imagine never, ever ever, needing to buy another cleaning product. Ever. Now, imagine replacing all your cleaning products with water. Activeion makes it possible. It basically looks like a regular squirty bottle on steroids, made from a polycarbonate blend which will last ages. The water reservoir part can hold up to 500ml of water and there is a eco-friendly long lasting rechargeable battery in the base to make it all work. The battery charges the regular tap water slightly and specialized nozzle that is attached transforms the charged water by passing it through an ion exchange to create an oxygen-rich mixture of positive and negative nano-bubbles. 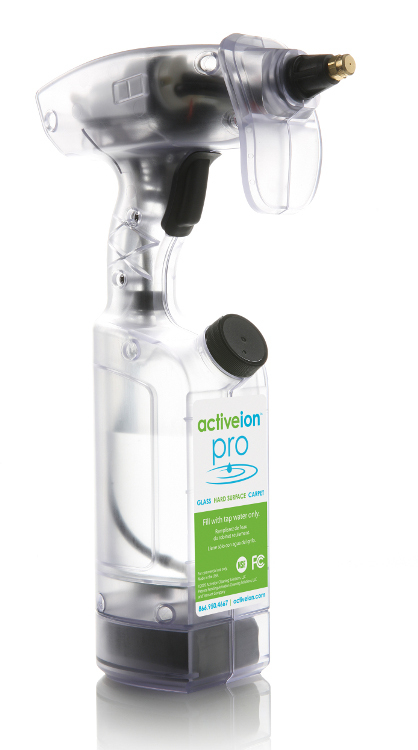 Now when you spray using the press and hold button (no trigger fatigue) the activated water will attract dirt like a magnet and lifts it from any surface, enabling it to be easily wiped away. Not only would you want one of these things at home, but imagine the long-term, not to mention eco-friendly, cost savings that it would take care of for restaurants, airports, universities, schools and the list goes on. This little guy will set you back by $299.99 though, but it’s an investment and really, you’d pay that for a good vacuum. 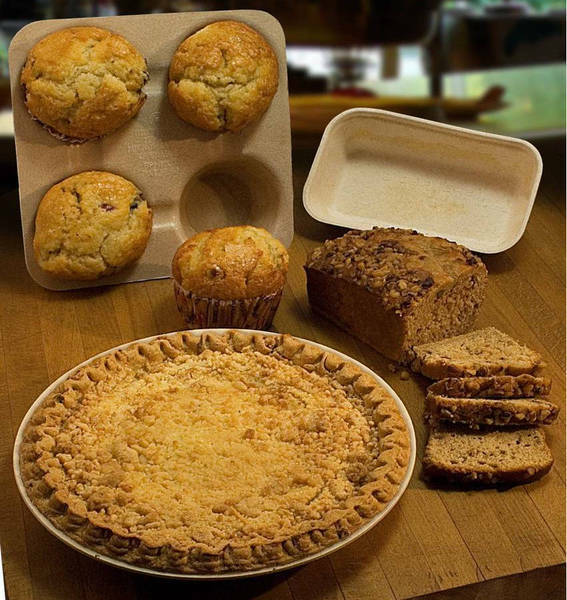 While we’re talking about interesting enviro-products, another company called Biosphere Industries launched a line of compostable baking ware in December. It’s been slowly getting out into the marketplace mostly being used commercially, but their website does allow you to order samples for a fairly reasonable price ($3.25 – $8.99). These have a multi-year long shelf life which is surprising but will biodegrade in 40 days outside. They can be used in ovens (up to 420ºF) and microwaves safely and can also be frozen and still not go soggy. Discovering this cool new way to bake was as a result of flipping through a Packaging Digest magazine which also had a couple of other neat new products that will pop up on shelves in the near future. 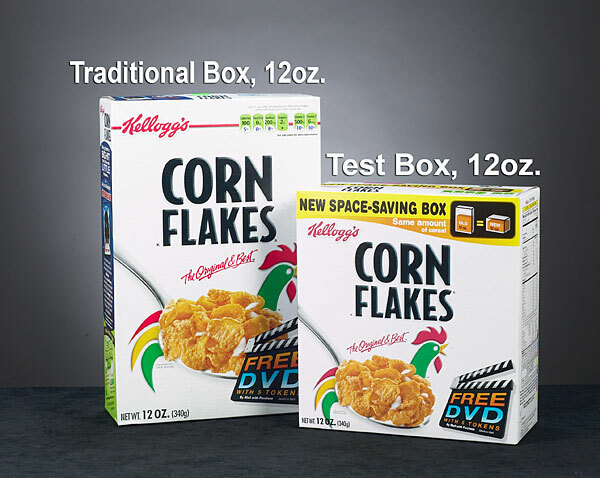 From environment saving to space saving, Kellogg’s is introducing a shorter fatter cereal box for 2009. It’s only available in some test markets for now, but this change is probably one of the most monumental to the world of cereal in a very long time. The previous items highlighted have been primarily sold with the ‘green’ approach, but that’s not to say the environment is less of a concern here. This shorter stubbier box uses 8% less material then its processor. The test phase will likely run for six months or so before this space saving alternative becomes globally available – pending consumer support. The last new innovative approach to an already familiar product that to put under the spotlight is from Colgate. Not particularly eco-conscious or space saving, there is a neat convenience factor. One of the most annoying things in the world for just about everyone is the fact that you have no idea where the toothpaste is in the tube or how much is left once it’s past a certain point. 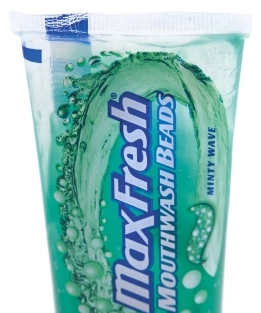 A packaging company called Sealed Air has developed a new completely clear tube for the Colgate line of products! One more of life’s little frustrations all taken care of!